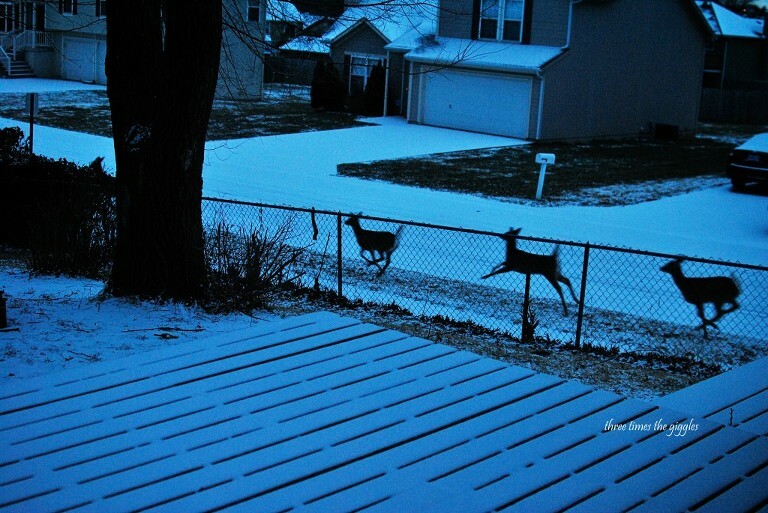 Early this morning, Chase and I were lucky enough to see 10 deer running down our street! I’ve never seen even close to that many all at once in our neighborhood. I grabbed the camera, didn’t have time to make any settings adjustments and snapped off one picture as the last 3 deer ran past my house. I thought about removing the blue color cast, but honestly I think the blue coloring of the early morning hours with fresh snow on the ground is just magical looking! I love it…and the blue! And kudos to you for having the camera close enough you could snap a shot. That’s been my challenge so far.